TOM SEIDELL WAS SHOCKED when he learned that his mother, Cathy, had multiple myeloma — he had never before heard of that type of cancer. It was 2011, and he was just starting his first job out of school. His twin sisters were in college. The three felt helpless. Then Liz, one of the twins, found out about the Multiple Myeloma Research Foundation (MMRF). She, Seidell and their sister, Erica, began participating in half-marathons to raise money for research. “It was our way of having some sort of fight alongside our mom,” says Seidell, now 31. Following a stem cell transplant in 2011, his mother went into remission and was soon back to work, but in late 2016 her disease came back. In January 2017, she lost her fight with multiple myeloma. “She always had the most positive outlook on everything throughout her entire battle,” Seidell says. 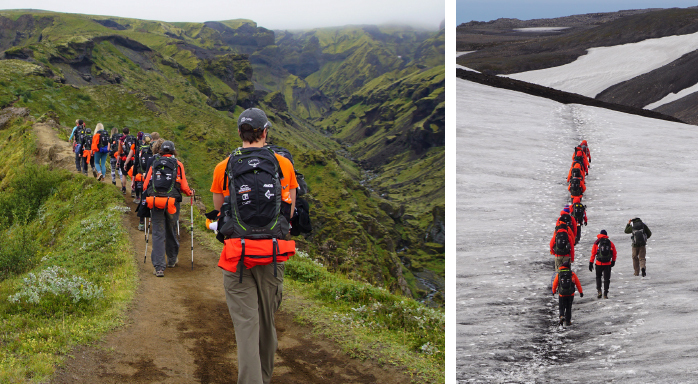 On Aug. 8 to 12, during the week of what would have been his mother’s 67th birthday, Seidell and 15 others hiked what is known as Fire and Ice, a trek in Iceland. The team consisted of five patients, Rich Appelbaum, Barbara McCarrick, Jen Phlieger Ansier, Emily Schottman and Brian Smith; seven caregivers, Erin Calufetti- Schumacher, Alex Cavin, Mary Gilbride, Erica Harrison, Jane Hoffman, Tina Mattis and Seidell; a myeloma doctor, Cesar Rodriguez, M.D. ; Marty Murphy, director of patient education for CURE Media Group; and John Waller and Ben Canales of Uncage the Soul Video Production. Known for its dramatic landscape, Iceland boasts volcanoes, geysers, hot springs and lava fields, as well as massive glaciers that are protected in national parks. 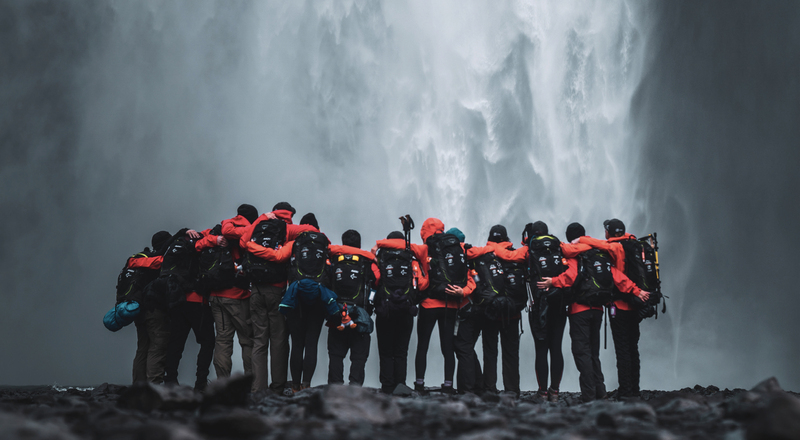 The Iceland trek is the ninth endurance event hosted by Moving Mountains for Multiple Myeloma, a collaboration between CURE Media Group and MMRF and sponsored by Celgene to raise awareness and funds for myeloma research. The team has raised $135,000 so far, already exceeding the goal of $120,000. The five-day trip consisted of three days of hiking nearly eight hours a day and then taking shelter in mountain huts overnight. The most physically challenging part of the hike was a long, narrow ridge known as the Cat’s Spine. “The will to achieve the goal of getting to the summit, to getting through this together, is a not only a metaphor for overcoming cancer but (also) is a powerful experience that helps patients show themselves — and the world — that they can go back to the days before they were diagnosed. And they can actually live their dreams,” says O’Neill. Since 2016, Moving Mountains for Multiple Myeloma teams have taken on Mount Kilimanjaro twice; multiple treks in the Grand Canyon, including Havasu Falls; Machu Picchu; Mount Fuji; and base camp at Mount Everest. These adventures have brought in more than $2 million — all collected through fundraising completed by each member of the team. Although a relatively uncommon cancer, multiple myeloma is the second most common blood cancer. More than 30,000 cases will be diagnosed this year in the United States, affecting more men than women. Despite many breakthroughs in treatment, there is still no cure. Over the past 20 years, the MMRF has funded more than $400 million in myeloma research. The foundation works with 25 centers of excellence throughout the world, including Dana-Farber Cancer Institute in Boston and Memorial Sloan Kettering Cancer Center in New York City. “When we fund this research, it is with the stipulation that all of our researchers must collaborate, must fill the clinical trials quickly and must share the findings with other researchers worldwide,” O’Neill says. In the past 11 years, the Food and Drug Administration has approved 10 anticancer drugs to treat multiple myeloma — that’s the amount of time it usually takes for one new drug to come to market, according to O’Neill. “The life expectancy of a patient with myeloma has tripled in the last 10 years,” she says. To prepare for the Iceland terrain, the team participated in a practice hike in North Carolina three months prior and also trained on their own. Phlieger Ansier and Schottman, who both live in Austin, Texas, trained together in hilly local neighborhoods. The two met in a coffee shop seven years ago, when Phlieger Ansier shared her wigs with Schottman. Both women received a diagnosis of multiple myeloma when they were in their 30s, much younger than the average age of diagnosis — 65 years old. McCarrick agrees. The 59-year-old, who joined the team and supports the MMRF to inspire and raise awareness, says she was in disbelief after being told she had multiple myeloma in 2009. Ironically, McCarrick, an occupational therapist who lives in Pleasanton, California, had worked with patients with multiple myeloma. After her diagnosis, she immediately began radiation and chemotherapy, then underwent a stem cell transplant later that year. In early 2010, she was in complete remission. However, she relapsed in 2013 and went back on chemotherapy — Revlimid (lenalidomide), an oral drug, and subcutaneous Velcade (bortezomib). Since January 2014, she has been in remission, with no maintenance medication.